It is no doubt Indonesia also has diverse cultures and diverse culinary uniqueness. If you are sure you know the original Indonesian cuisine or traditional foods, if the first cake or traditional cuisine made ​​on a given day may the celebrations and customs, but now we can easily find a culinary or that we often jajaan market. 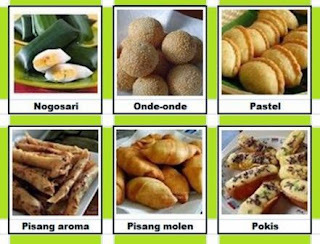 It feels very attracted to me to write and review about various native Indonesian traditional snacks. Hearing the word fried bananas we already know that his basic material dalah Bananas Maybe in some countries the term goeng bananas are very unique because in other countries they only eat bananas directly without having in cooking. Pempek very famous especially pempek Palembang. Pempek be one mascot or icon of Palembang, Indonesia hamping everyone knows about pempek Palembang. Cimon is one of the unique dining because it is made of material that is very simple and traditional, flour aci. Pastiny you really know and nev eat this cake. Getuk cake is you food made ​​from cassava and its main ingredient is mixed with sugar. Wow, this is one of my favorite foods and maybe you are also very fond of her. Bakwan is maknan or jajaan that we often encounter in the streets verges. You do not have to worry about finding this cake. Bakwan very easy to temuai possible in almost every side of the road you can find it. 0 Response to "Snacks are typical Indonesian market"